Iranian protesters chant slogans during a demonstration condemning the execution of Shi'ite cleric Sheikh Nimr al-Nimr in Saudi Arabia, at Imam Hussein Square, in Tehran, Jan. 4, 2016. Boiling tensions between Iran and Saudi Arabia risk dooming fragile, painstaking efforts to negotiate a Syrian peace deal as the fallout from the Saudis’ execution of a Shi’ite cleric spreads across the region. The escalating confrontation over the execution of Sheikh Nimr al-Nimr and three other Shi'ites, along with 43 Sunni Muslim jihadists, on terrorism charges, is already worsening Islamic sectarianism in the region, with allies and proxies taking sides and threatening retaliation. Western diplomats are now scrambling behind the scenes to persuade the Saudis to refrain from executing al-Nimir’s nephew, who also faces a death sentence for participating in anti-government protests like his uncle. 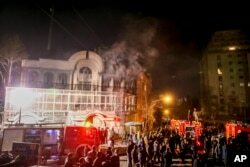 But the rhetorical confrontation between Riyadh and Tehran - initially over the beheadings and then over the weekend storming of the Saudi embassy in the Iranian capital by protesters -- is already turning violent, risking more trouble between the two regional powers best positioned to help shape an end to the nearly five-year-long Syrian conflict. Allies and proxies of the Saudis and Iranians are already making their feelings felt — and not just with words and protests. Bomb blasts rocked two Sunni mosques in Hilla, 80 kilometers south of Baghdad; a Sunni imam in Iskandariya, in central Iraq, was killed by a gunman; and police came under heavy gunfire Sunday night in Sheikh Nimr's hometown of Awamiya in Saudi Arabia's restive Eastern Province, leaving one civilian dead and a child wounded. More could come, warns David Weinberg, an analyst with the Foundation for the Defense of Democracies, a Washington DC-based think tank. He fears both Tehran and Riyadh could miscalculate their responses. “The danger of all of this is that it could lead to miscalculation militarily in the region by the Saudis and the Iranians, ...with violence spinning out of control due to the reactions of terror properties of Iran retaliating, as they had threatened to do, if al-Nimir was executed,” he says. “This is going to be very hard to contain,” he adds. “Saudi Arabia has been tone deaf for years about how its conduct towards the Shia minority in the kingdom engenders a backlash,” he says. Likewise, Iran appears to have handed the Saudis a public relations and strategic victory — at least as far as Saudis’ Sunni Gulf neighbors are concerned — with the storming of Saudi Arabia’s embassy in Tehran. The Iranian government insists that it was not behind the protest, but the Saudis insist the storming of the mission was a purposeful escalation. The stage is set for both sides to exploit the row. Smoke rises as Iranian protesters set fire to the Saudi embassy in Tehran, Jan. 3, 2016, to protest against the execution of a Shi'ite cleric by Saudi authorities. Iran’s powerful Revolutionary Guards warned Sunday that the execution of al-Nimr will lead to the “downfall” of the Saudi monarchy. Analysts say that in retaliation, Iranian hawks are likely to encourage restive Shi'ite Muslims in eastern Saudi Arabia to up their political agitation against the ruling House of Saud. Bahrainis fear this will also happen in their emirate, where a long-running, low-level insurgency has been under way since Bahrain's majority Shi'ite population began protests in 2011 against the emirate’s Sunni rulers. Bahrain’s leaders say they have seen signs of increased Iranian agitation. In July, the Bahrainis withdrew their ambassador from Tehran after claiming the Revolutionary Guards were behind a plot to smuggle arms into the country, orchestrated by two Bahraini nationals with close ties to Iran. And, in October, Bahrain accused Iran of seeking to topple the Bahraini royal family, claiming Iran’s Revolutionary Guards were training Shi'ite terrorists. A Bahraini protester holds up a picture of Saudi Shi'ite cleric Sheikh Nimr al-Nimr in front of a riot police officer in Daih, a largely Shi'ite suburb of the capital, Jan. 4, 2016. The row between Riyadh and Tehran comes at a difficult moment for efforts to find a political solution for the wars raging in the region — conflicts in which Iran and Saudi Arabia are backing opposing sides. Developments inside and outside Syria are not helping advance peace. Russian airstrikes and Syrian government barrel-bombing of civilians are hardening rebel sentiment. Regional rivalries have complicated the search for peace from the outset, but last month there were signs that both Tehran and Riyadh were getting more serious about resolving the conflict. Saudi Arabia played a key part in brokering a deal between more than 100 Syrian rebel and opposition groups, securing an agreement between them over a negotiating framework. But with confrontation flaring between Iran and Saudi Arabia, the prospects for the Syrian peace talks look even more forlorn. And the standoff may help hardliners in Iran, who have already been maneuvering ahead of next month’s parliamentary elections, seen as a crucial test of reformist President Hassan Rouhani’s authority. Hawks have already been seeking to gain the upper hand with a civil liberties crackdown and Rouhani has been unable to rein in the country’s security apparatus.